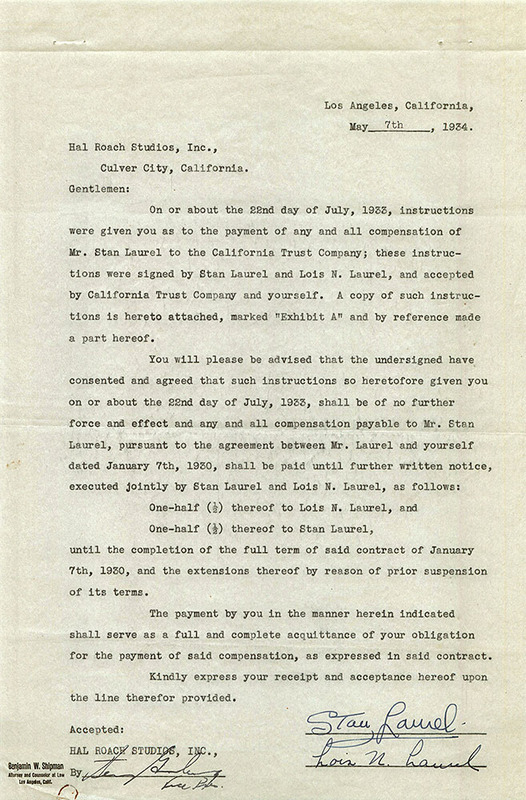 On or about the 22nd day of July, 1933, instructions were given you as to the payment of any and all compensation of Mr. Stan Laurel to the California Trust Company; these instructions were signed by Stan Laurel and Lois N. Laurel, and accepted by California Trust Company and yourself. A copy of such instructions is hereto attached, marked "Exhibit A" and by reference made a part hereof. One-half (1/2) thereof to Stan Laurel, until the completion of the full term of said contract of January 7th, 1930, and the extensions thereof by reason of prior suspension of its terms. The payment by you in the manner herein indicated shall serve as a full and complete acquittance of your obligation for the payment of said compensation, as expressed in said contract. Kindly express your receipt and acceptance hereof upon the line therefor provided. THAT, heretofore, on the 22nd day of July, 1933, Mr. and Mrs. Laurel entered into a written agreement of property settlement, which was subsequently approved by the Superior Court of the State of California, in and for the County of Los Angeles, as part of the proceedings had in an action for divorce then pending between the parties hereto. That in such agreement of July 22nd, 1933, hereinafter referred to, for the purpose of convenience, as the property settlement, Mrs. Laurel is referred to as the first party and Mr. Laurel as the second party. THAT, since the execution of the property settlement, some differences have arisen between the parties relative thereto, and modification thereof has been agreed upon between the parties, conditioned, however, upon the event that the modification shall be fully and completely performed, and, unless performed, the property settlement, as executed on July 22nd, 1933, shall remain in full force and effect as originally written. ...necessary for the approval of the terms hereof by any Court, and each of the parties hereto shall faithfully and to the best of his or her ability proceed with the carrying out of the terms hereof, which shall supplant, in those particulars set forth herein, the terms of the contract of July 22nd, 1933, but in all other particulars said contract shall continue in full force and effect. Each of the parties hereto will, at the request of the other, join and/or execute such documents, from time to time, as may be reasonably necessary to effectuate the purposes hereof. It is understood that the performance of the terms hereof by Mr. Laurel, as herein expressed, shall serve as an acquittance and substitution for the obligations expressed on his part to be kept and performed in the agreement of July 22nd, 1933. IN WITNESS WHEREOF, the parties hereto have hereunto set their hands, the day and year first above written.